Question: I water my lawn every day, but it still looks like it’s drying out and turning brown. What is the correct way to water? Answer: Usually there’s plenty of rain on Long Island during April, May, and sometimes well into June, but this year we weren’t so lucky. And summer rainfall has not been forthcoming. Most lawns need an inch or so of water each week to stay green, which is approximately how much moisture they lose weekly through evapotranspiration. I suspect you are running your sprinklers for twenty minutes or so daily. Unfortunately, this means you are wasting lots of water and not helping your lawn. A brief daily shower only moistens the grass blades and doesn’t deliver enough water to the turf roots, which is why your lawn is going into drought stress. Daily watering led to the drought-stressed lawn at the top of this picture. Below it, the next-door neighbor’s green grass receives only an inch of water once a week. The best way to water your lawn with an inch of water is to soak it just once a week, which may take several hours depending on your water pressure and sprinkler heads. You can determine how long your system takes to supply one inch of water to your lawn by setting several empty tuna cans inside the spray pattern of your sprinklers and watching until they fill up to one inch; or you could buy a few inexpensive plastic rain gauges. Alice Raimondo is Horticulture Consultant for CCE Suffolk. She can be reached at aw242@cornell.edu or 631-727-77850 x335. 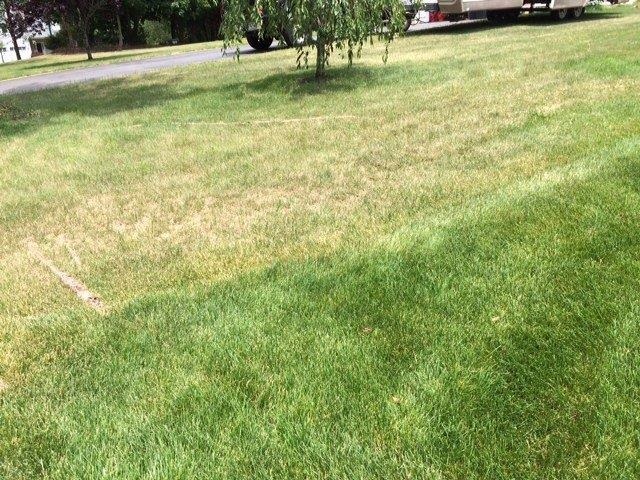 This entry was posted in Lawn care, Long Island gardening, Waterwise gardening and tagged brown grass, drought stress, green grass, Healthy Lawns Clean Water, irrigation, rainfall, watering lawns on September 4, 2015 by Robin Simmen.